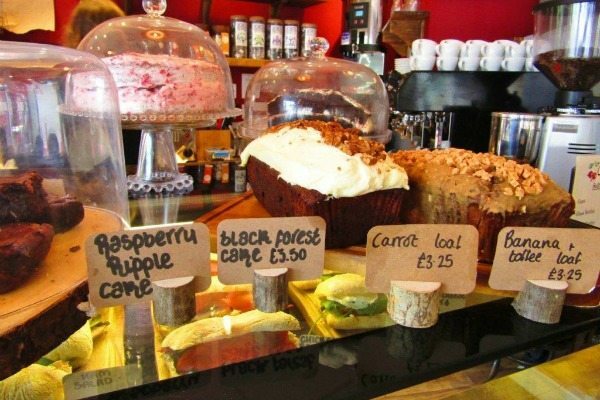 In the middle of the Marina Square shopping precinct, just off the Waterfront and a short walk from the harbour and the cinema, is a delightful new independent café. 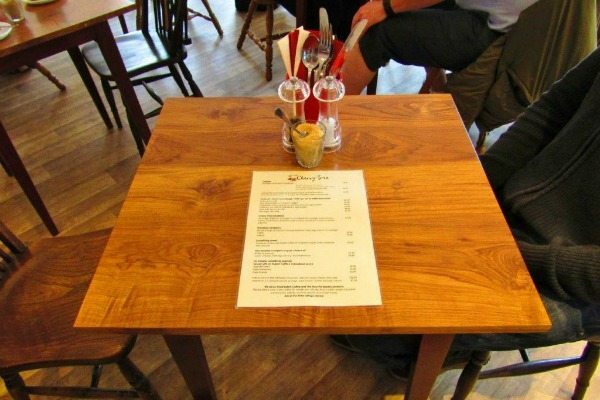 Impossible to miss with its striking red blossom motif, The Cherry Tree brings you a fantastic selection of delicious, lovingly cooked breakfasts and lunches, including a good selection of scrumptious vegetarian options. Owner Gabi and chef Tom head up a young and enthusiastic team who source their ingredients locally and proudly support local business. 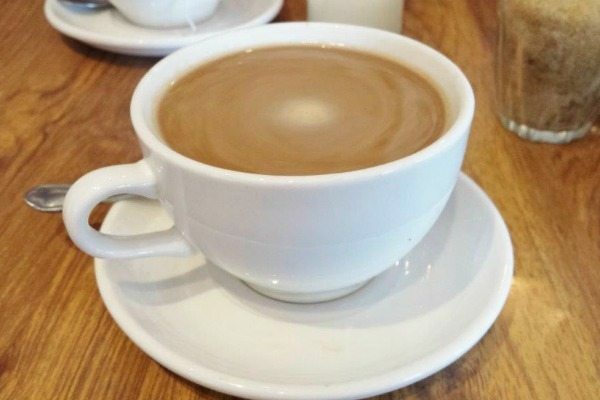 Their coffee comes from Brighton’s own Small Batch Coffee Roasters, their bread and pastries from the Brighton-based Flour Pot Bakery and their sausages from the fabulous Brighton Sausage Company. 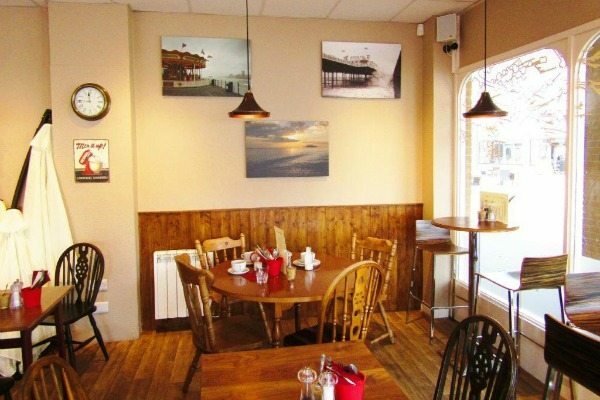 Inside it is light and bright with large windows and a cheery décor combining cream walls hung with photographs of Brighton landmarks and vibrant cherry red accents. Together with lots of warm-hued wood it creates a cosy, comfortable feel. 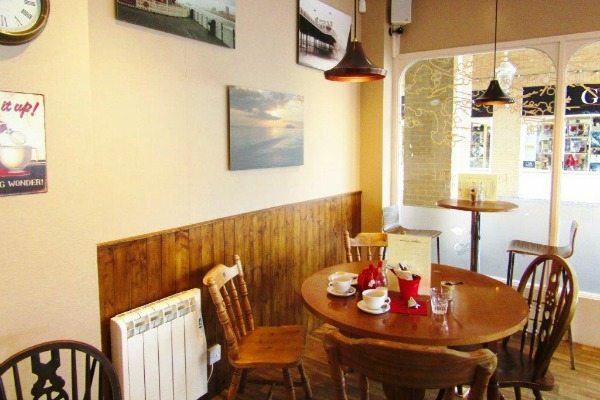 An ornate ceiling fan circulates a lovely breeze but, if it’s real fresh air you’re after, there’s plenty of outside seating for when the weather is fine. Wherever you sit, you can enjoy your meal while gazing enviously at the extravagant yachts moored in the canal. If that doesn’t float your boat (groan), you can take advantage of the free Wi-Fi and plug yourself into the internet instead. 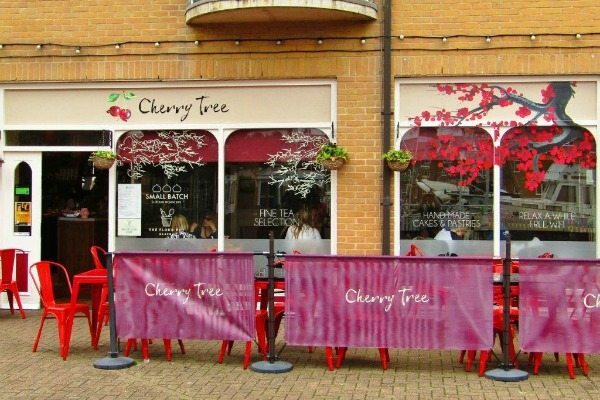 It is testament to its success that even though The Cherry Tree has only been open for a few months, it was packed and buzzing with lively conversation when we arrived. It is clearly already proving very popular. 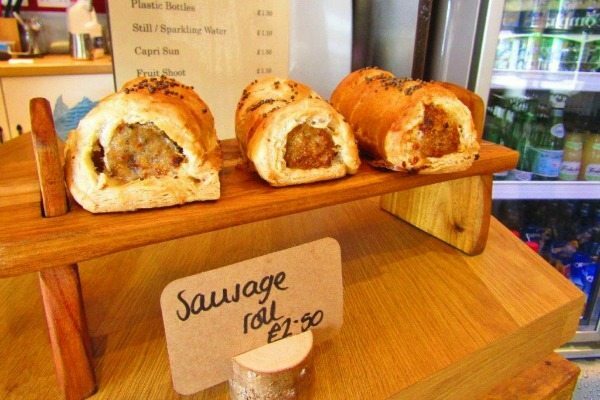 Once you have chosen your food you place your order at the counter, which is loaded with tempting goodies including the most fantastic-looking sausage rolls and a selection of sinful home-made cakes plastered with thick, creamy frosting. Beneath the counter is a deli fridge similarly packed with savoury delights, with everything from pizza bread and filled croissants to rolls and paninis generously stuffed with yummy fillings. To drink Andrew had an Americano with hot milk and I had a cup of English Breakfast tea. The cups were nice and big, the brews good and strong and the milk came in dinky little milk bottles. Our brunches arrived in impressively short order, steaming hot, and on immaculately clean crockery. 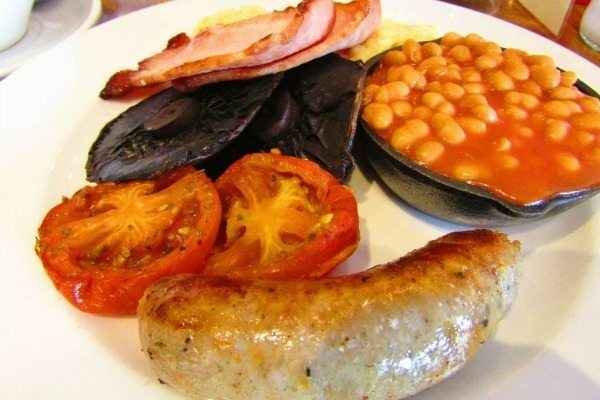 Andrew ordered The Cherry Tree Breakfast, which comes with two eggs, cooked as you like, a Brighton Sausage Co. Cumberland sausage, two slices of back bacon, baked beans, mushrooms, a slow roasted tomato and two slices of toast or bread and butter. Andrew asked for his eggs scrambled and they were fabulous, rich with butter, soft, fluffy and moist, and perfectly seasoned. The sausage was plump and meaty, full of flavour and subtly peppery. The two big Portobello mushrooms were succulent and earthy and the tomato was juicy and delicately flavoured with herbs. The thick, salty bacon was beautifully crispy around the edges and the plate was finished with a miniature cast iron frying pan brimming with saucy beans. 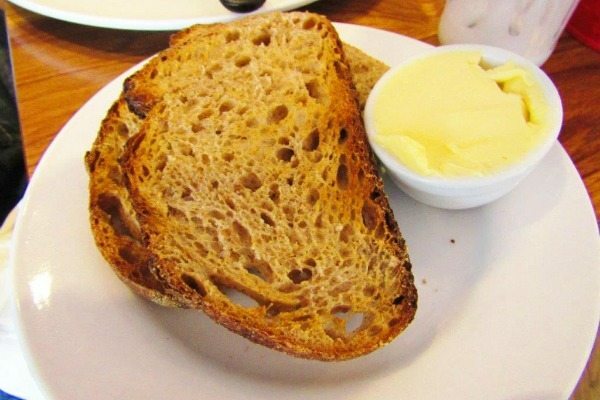 The toast on the side was made with a very tasty brown sourdough loaf and served with a little dish of butter. I decided to choose from the “something special” section of the menu, which included Eggs Benedict (with ham), Eggs Florentine (with spinach) or Eggs Royale (with smoked salmon). 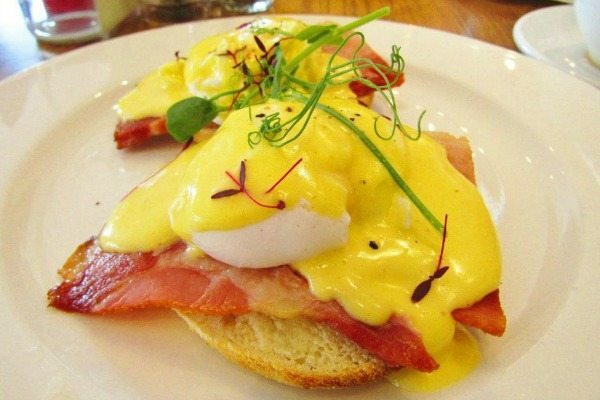 I opted for the Eggs Benedict and was served two beautifully poached eggs, with sumptuous, oozing yolks, on a thick slice of gorgeous honey roast ham, on top of a lightly toasted English muffin. All of which was generously slathered with a sublime rich, creamy, tangy hollandaise sauce. Finally, it had been decorated with pretty pea shoots and vivid purple Red Amaranth leaves and given a good grind of fresh black pepper. It was utterly scrumptious and definitely a real treat.